We’ve had a bit of a tidy up. I hope you find our new website prettier and easier to use. This is just the front end of many other changes. I’ve in fact revamped the whole business and how I work. In this post I want to get real about the ups and downs of dealing in vintage design, how I ran this business, what I’ve changed and what I’ve been up to recently. The low down on dealing in vintage design. Once upon a time in a land far, far away, I regularly sold vintage design through major auction houses and my own eBay store. Then I moved back to Australia from the UK. Suddenly I was far, far away from the A-list international buyers who purchase the offerings of Christies and Sotheby’s. The reputation of those two firms, for expertise and authority in the identification and valuation of vintage design, draws collectors from all over the world. Their centuries-old operations run like clockwork. I’d completely lost access to my primary market. An Aldo Tura suite - Credenza, Dining Table and Games Table. I submitted these for auction at Sotheby’s in 2005. They fetched many times their listed price, due to the careful contact I made with collectors in Europe and the US to alert them to this auction. I was also far removed from the seemingly endless sources of vintage design that exist in Europe and the UK. On any given day I could find items by Hans Wegner, Aldo Tura, Gio Ponti, Ernest Race, Bitossi, Guzzini, the Eames studio, early Terence Conran and many of the Danish powerhouse designers, floating about on eBay or at the UK’s legendary car boot sales and smaller auction houses. By comparison, Australia seemed to have a limited pot of good design and a limited market of informed buyers ready to pay for premium items. It’s not that design is not well respected or valued in Australia but the existing appreciation is not supported by a critical mass - a large population with a shared sense of the meaning and importance of design - as there is in the UK and Europe. So my selling went into a hiatus of sorts. I had a good shot at my own garden design business and I continued to collect and sell a little through eBay. When the collecting side-hustle started making more income (and causing less muscle fatigue), I started selling exclusively through the Cabinet de Luxe website and eBay store. I eventually gave up gardening. A couple of years ago I tested out selling via ‘bricks and clicks’, at Smith Street Bazaar and continuing online via my website. In addition, I was running my eBay store, listing on Design Addict (a wonderful international design reference site and forum, you should check it out) and Antiques Plus in Australia. The Cabinet de Luxe stall at Smith Street Bazaar, October 2015 - just before opening night. The Hansen table and the blue wire chairs sold immediately. Smith Street Bazaar was a great experience (thanks to Eryca and Eddy, the good eggs and crazy-good vintage design dealers who run the place). Sadly, the mix of dealers there was not quite the right fit for me at the time (you should check them out now though - some of the best dealers in Melbourne under one roof!). I didn’t have great margins for error at the time so I closed down the bricks and went back to the clicks. Eighteen months ago I was invited to join 1stdibs.com, the US mega-site for high-end vintage design (and now also contemporary artisanal design). It was a game-changer. Their massive online traffic stats changed the landscape of my client base - from Australian95%:Other5%, to US95%:Other4%:Australian1% - overnight. All my old clients dropped away. That’s not hard to understand. Simply put, 1stdibs.com provides the opportunity for dealers to raise prices well beyond those achievable in the Australian market - on some items by massive margins of 500% and more. Yes, up to five times the Australian market price! However, this comes at a cost for smaller dealers like me. 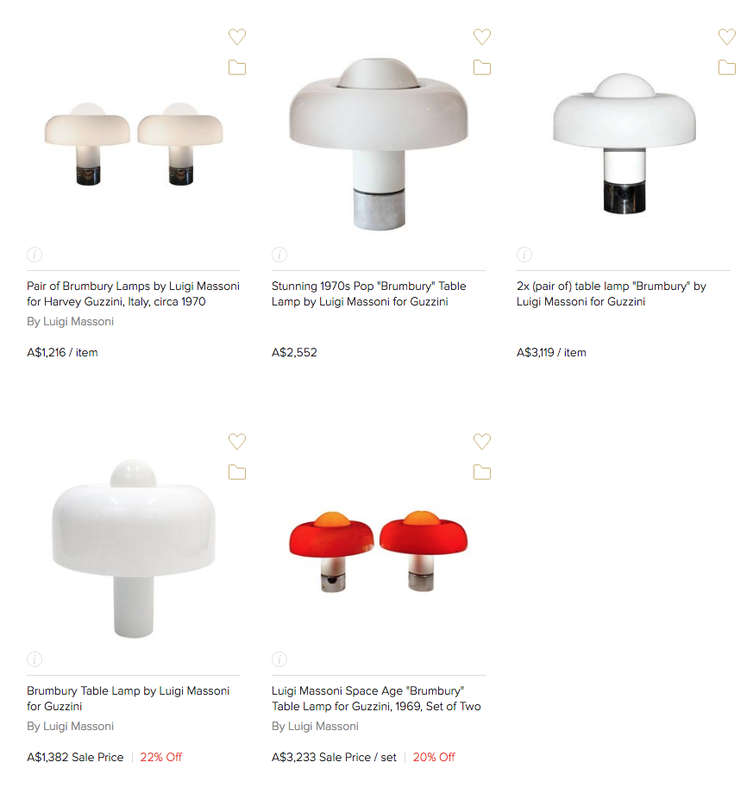 A selection of prices for Brumbury lamps on 1stdibs.com - our new Australian market price is top right. Price per lamp. Very competitive and exactly the price you’d expect to pay for this lamp in an Australian vintage design store. They are in immaculate condition. 1stdibs.com requires that your price on their site is the same as your price on your own site. This is perfectly understandable for dealers in the US, but for a small Australian dealer, it meant raising prices to the roof, in order to take advantage of the US market price and cover extra costs. These are privileged problems to have, but consider some additional time and costs: monthly membership fees, commission fees on sales, extra hours producing the best possible images so that overseas customers can see every facet of an item clearly. Items must be in premium condition to get attention on 1stdibs.com. I always have presented stock with great care and my regular customers know they can expect this. However, extra dollars needed to be spent on trouble-shooting finishes and upholstery to ensure they wouldn’t elicit negative responses or returns from very high-end and (justifiably) demanding US clients. This created a whole extra demand on my business. In addition, 1stdibs.com is a large marketplace and listings are hard to keep at the top. Once you do make a sale, there’s the time and cost of crating and packaging for overseas shipment. There are indirect shipping costs, such as more extensive insurance (all shipments are covered by 1stdibs.com but it pays to keep your backside covered for long haul shipments you can’t afford to replace) and international business liability cover. Another added cost - entirely my own choice - was to offer subsidised shipping on smaller items in order to compete with similar items of similar price being sold within the US by other dealers shipping at much lower cost to the client. As a consequence, costs and higher priced sales roughly evened out to give the same margin as in Australia. I used to have much lower prices but also much lower levels of expenditure, time and effort. In short, while 1stdibs.com is a great marketplace, it’s no easy ride for Australian dealers unless you can scale up quickly, list premium items very regularly and stay at the top of the listings. In an effort to reach all available audiences, I’ve been using five key sales funnels or channels. Luxury items are posted on my 1stdibs.com page and the Cabinet de Luxe website. More humble offerings are posted to the website and/or my eBay page. At times I list everything on eBay to build brand awareness. I occasionally list on Antiques Plus but no longer on Design Addict (it has a Euro-centric audience). I always post listings on Facebook and Instagram with links back to the products on my website. I’m a sole trader and really do everything myself apart from those things I’m not expert in or really can’t find time for. Anyhow, these channels have resulted in serving listings to mainly overseas customers. This has meant less time spent preparing new products and my own website for local customers. The website is where I once met most of the customers in my primary markets - those in Melbourne, Sydney, Adelaide and Brisbane. It’s time to change back to that model but also take the many things I’ve learned on the seller side of 1stdibs and apply them to my own website. My old website lacked the functionality I required to take further steps. After a bit of research I settled on Squarespace.com as a host. I chose it for it’s ease of use, compatibility on all devices and beautiful, easy-to-manage templates. A shopping cart was lower on my priority list because most of my sales are conducted person to person. I’m focussing on my original customer base - Melbourne, Sydney, Adelaide and Brisbane. I’ve set about making my products and prices more accessible to online shoppers inside Australia. I’ve dropped prices back to competitive Australian market prices, which is what attracted my original customers. I’ll stay on 1stdibs.com for the foreseeable future while I perform an experiment. Australian customers can now shop on 1stdibs.com or the Cabinet de Luxe website at the same Australian market price, no longer the high prices of the US market. Will this increase Australian sales via 1stdibs.com? this new, lower price point offers US buyers a great opportunity to take advantage of the US/AUD exchange rate. You’ll find similar products much more cheaply on my 1stdibs.com storefront than you can find them from most dealers in the US. Will this increase US sales? I’ll provide fast shipping quotes: metropolitan, regional and rural Australia and overseas now all have a one hour shipping quote turnaround (except when I’m sleeping). I’ll get most items on the road within 24 hours of purchase with the help of shipping partners I’ve developed through meeting 1stdibs.com demand (unless the item requires construction of a custom crate, which will add one to two days). for overseas clients coming direct to the Cabinet de Luxe website, there will now be a big exchange rate differential in your favour which will more than balance out shipping costs and make my offering more competitive - ask for a shipping quote! I’ll keep you up to date with my progress and the success or otherwise of this plan as I go. You can now shop Cabinet de Luxe on your mobile or tablet. I think the site looks pretty good and navigation is a snap. Shopping for interior design objects, furniture and lighting on your mobile might not seem very satisfying in comparison to stalking the walkways of your local vintage bazaar. That said, it’s a great place to start the purchase process, especially if you’re looking for something specific. Having searchable access to multiple vintage stores on your phone makes searching and comparison easier and, hopefully, finding a particular item a breeze. 1stdibs.com/cabinetdeluxe includes a great feature you might want to explore. Using your smartphone, select any Cabinet de Luxe item listed in my storefront, go to the ‘View in Room’ feature at the foot of the first image, hold your phone up for a view of the room you’re in, scale the item up or down to fit and get a good idea what the item will look like in situ. Handy! With these focussed sales channels, better prices, clear navigation and shipping quote requests, I hope you’ll find it easy and fun to shop at Cabinet de Luxe. Please explore the site. If you fancy further insight into the design dealing industry and what stock’s coming up, sign up for my regular newsletter - I’ll be keeping it short and sweet. You can see day to day listings as they pop up by following @cabinetdeluxe on Instagram. If you have any areas of friction or resistance to online shopping for furniture and lighting, please let me know in the comments below or use the contact form. I’d love to hear how I might be able to improve your experience. Enjoy browsing. I hope you have fun with it!